If you’re logged in to Facebook you can try it right now by visiting our landing page. Head to the Grow tab on your bot's dashboard to find the Customer Chat code generation tool. Press Enable and fill in the domain of your website (and optionally also a ref parameter). Copy the generated code to your clipboard by pressing the Copy button. Open your website's source and paste the code between the <body> tags of the HTML. logged_in_greeting="optional greeting message for logged in users"
theme_color: This optional field represents the color to use as a theme for the plugin, including the background color of the customer chat plugin icon and the background color of any messages sent by users. Supports any hexidecimal color code with a leading number sign (e.g. #0084FF), except white. logged_in_greeting: This optional field represents the greeting text (max. 80 characters) that will be displayed if the user is currently logged in to Facebook. logged_out_greeting: This optional field represents greeting text (max. 80 characters) that will be displayed if the user is currently not logged in to Facebook. 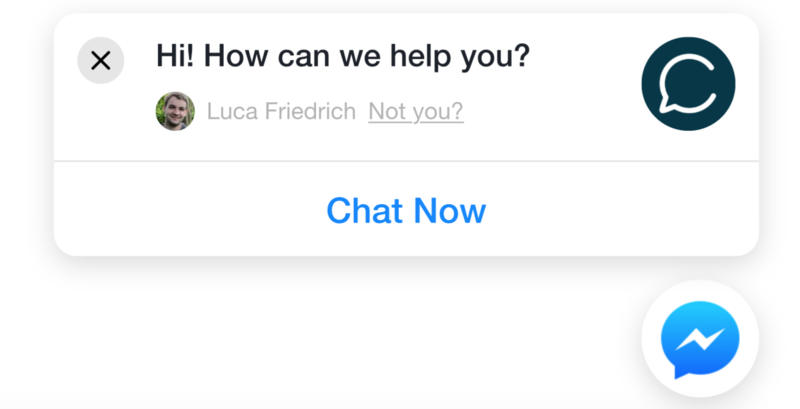 In collaboration with our partner agency Master of Code we have launched a WordPress plugin to integrate Customer Chat right into your site without having to copy & paste any code. Go to Plugins > Add New on your WordPress dashboard and type in Chatfuel Customer Chat. Select the Chatfuel Customer Chat plugin by Chatfuel & Master of Code and press Install Now. Download the plugin and extract the chatfuel-customer-chat folder. With your FTP software, upload the chatfuel-customer-chat folder to the wp-content/plugins folder in your WordPress directory. Go to Plugins on your WordPress dashboard and find Chatfuel Customer Chat in the list. If the Customer Chat Plugin does not render on your page please make sure that your website's domain is included in the Domain Whitelisting section of the Configure tab on your bot's dashboard and that your website is served over HTTPS.